This perennial wildflower is common throughout the UK and Ireland. 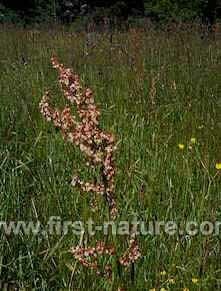 This tall member of the dock family, with its long, thin leaves, has an acidic taste. The flower heads turn from green through orange and red to brown during May, June and July. Riverside margins that have been fenced off to keep cattle and sheep out make ideal habitat for this perennial plant, which also occurs in many permanent pastures. Apart from the well known broad-leaved dock, whose leaves are used to aleviate nettle stings, other members of the dock family include French sorrel, a small, slimmer relative of common sorrel, and the invasive alien plant Japanese knotweed. The picture shown on this page was taken in June in West Wales.